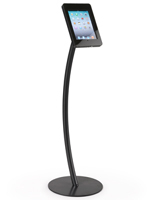 The iPad stand is a hands free design with a curved post which is 48-1/4” tall and accommodates a variety of Apple® products . 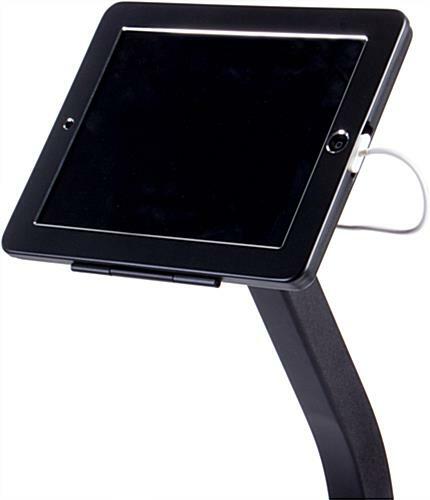 Included with the kiosk is an integrated charging kit and an additional adapter cable that can be switched for the newest tablet. 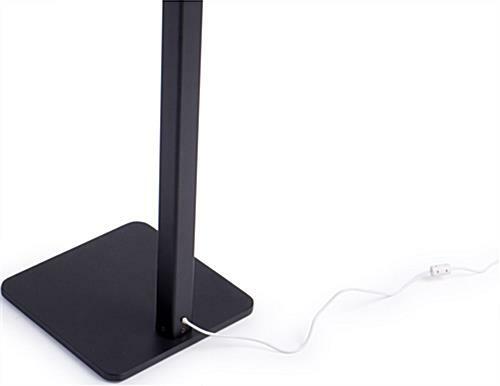 The USB power cables are managed inside of the pedestal of the digital notebook stand and the 39” long connection can be plugged into a standard Apple® charger or a computer for continuous power support. A 10 lb. 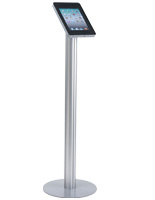 weighted base and an adjustable bracket make this floor model a great kiosk for public and commercial use. 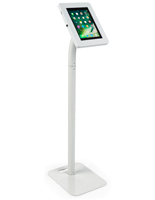 The tilting and rotating enclosure of the stand features a locking mechanism to keep the tablet safely secured inside from theft and unwarranted tampering. An exposed home button design allows full access to the tablet. The mount can be used in landscape or portrait orientation. 8.3" x 48.3" x 9.8"
9.8" x 0.5" x 9.8"
7.6" x 9.8" x 0.5"
We've had two of these with a power cord that failed. Our fix, on the show floor, was buying another iPad cable (black) and taping it down the back of the pole. 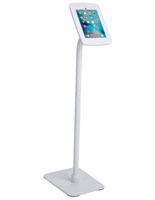 Other than that, the stand is nice and heavy weighted with solid construction. Jarod, thank you so much for taking the time to write this review. We're so sorry that the included power adapter failed with this unit, but we're glad that you were able to find a solution. We'll certainly send this along to our product team to investigate the cause, and our customer care team will contact you shortly to see if there's anything else we can do to make this a better experience for you. Thanks again! Thank you so much, Joseph! We're glad that our iPad Stands arrived quickly and you found them to be perfect for your needs! 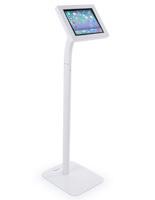 We hope you continue to turn to Displays2go for your trade show needs! The stands are out quickly, they were very easy to put together, and we are very impressed with the quality. Would definitely recommend. We are using them for weekly kid check in at our church and they are working great. I really love this stand and the key lock. Great buy for the price. Thanks to Displays2go for the quick delivery. 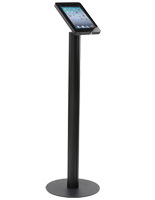 We just received our iPad stand and so far it was just as described. The lock is secure and the adapter cushions fit amazing. It's nice to have a product just as described.